Okay, now that the Rapture has [allegedly] officially started, let’s have a little fun with it, shall we? Shamelessly stolen from the folks at Gizmodo (who normally write tech blogs, but inexplicably decided to weigh in on religious mania): a hysterical “punk” to play in the initial hours of the Biblically foretold time when the “saved” are bodily lifted into Heaven. On May 21, get a bunch of your old clothes in full sets of pants, shirts, and shoes. Bonus points if you leave accessories like an old watch or sunglasses to go with them. 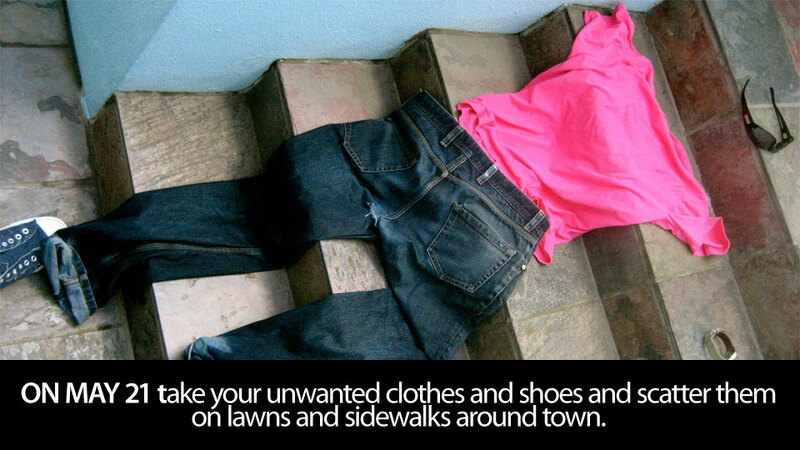 Lay them out as if people have suddenly disappeared, leaving only the clothes behind. Be creative. Take pictures. This entry was posted on Saturday, May 21st, 2011 at 9:24 am and is filed under Uncategorized. You can follow any responses to this entry through the RSS 2.0 feed. You can leave a response, or trackback from your own site.